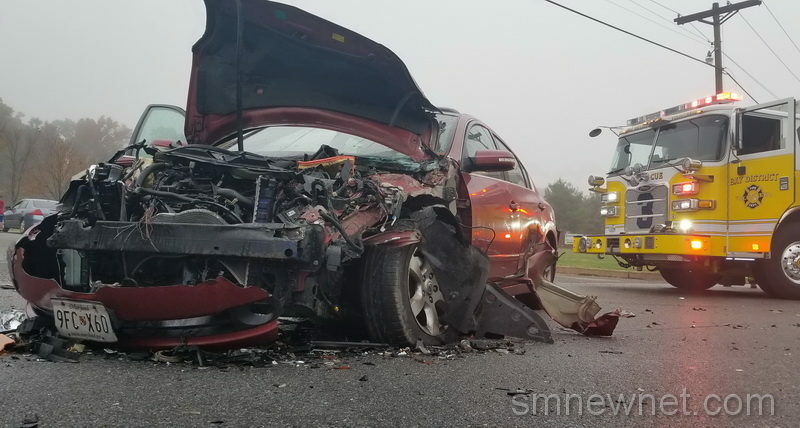 On November 6, 2018, at approximately 7:00 a.m., police fire and rescue personnel responded to Point Lookout Road and Seth Court in Callaway, for the reported serious motor vehicle accident with a vehicle overturned, and one person trapped. 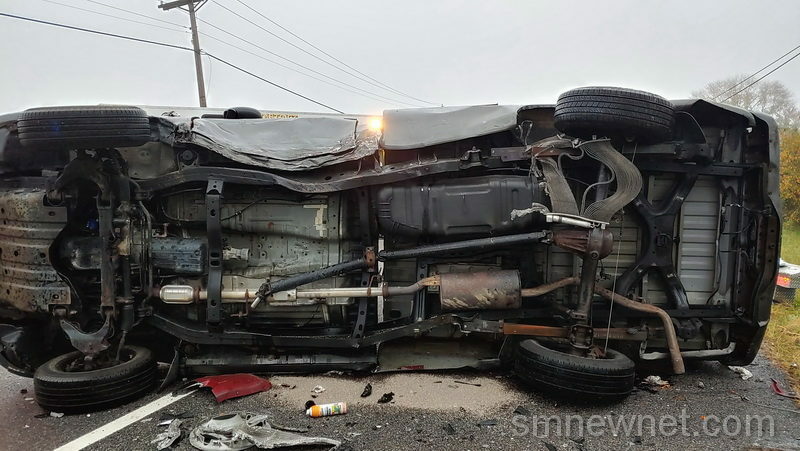 Crews arrived on scene to find two vehicles in the roadway, and one vehicle overturned on its side, with the single occupant trapped. 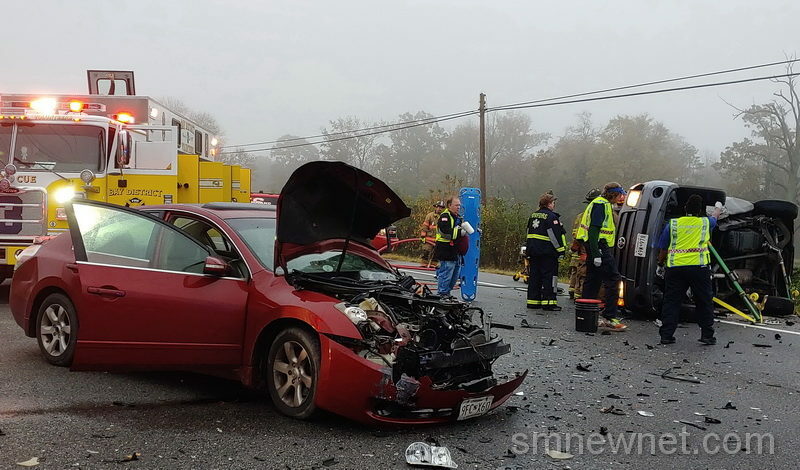 After approximately 10 minutes, firefighters extricated the patient from the pick-up truck and emergency medical services took over patient care. Two patients were transported by ambulance to an area hospital with non-life-threatening injuries. 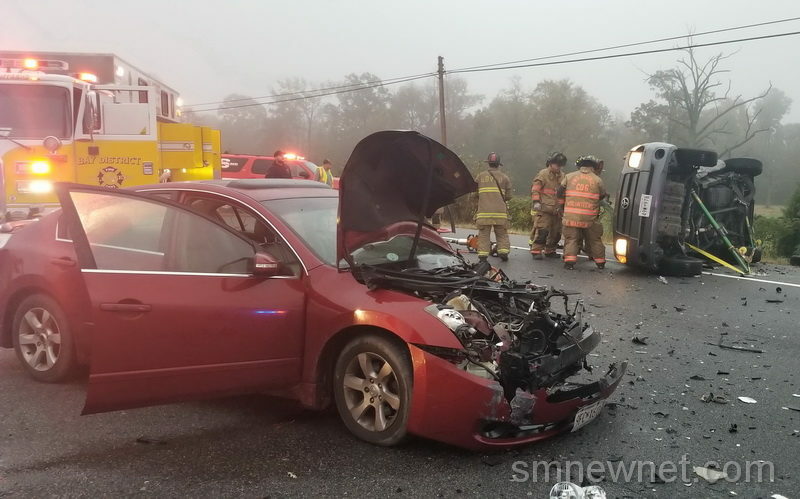 Maryland State Police are investigating the crash, and updates will be provided when they become available. This entry was posted on November 6, 2018 at 9:08 am and is filed under All News, County, Fire & Rescue, Law Enforcement, St. Mary's News, Top News, z 600X120 Top Ad Bottom, z 600X120 Top Ad Top. You can follow any responses to this entry through the RSS 2.0 feed. Somebody pull out in front of someone else? yes grey truck pulled out in front of car.the car hit the truck at 50mph. That is a weird looking rear diff setup. What are those 2 curvy looking parts near the LR wheel? I think they are just bits of plastic from the other car. Whats up with yellow firetrucks? stfu, second district was there as well. Look more closely at the picture, get a scanner, or better yet volunteer and you will know exactly who responded. Second district also responded, check your facts. Or better yet volunteer that way you will know who responds to what. Not sure who you are, but you are totally out of line on this call. Valley Lee did respond, and pretty quickly too! While all the Fire and Rescue personnel are volunteer, Baby District and Lexington Park, pretty much have a full team ready to go, to any call, at a minute’s notice. All the other companies in St. Mary’s must have people respond from where ever they are, to the station, wait for a full crew, then dispatch to the incident. Kudos to Bay District and LPVRS for being able to respond quickly, but they all deserve credit for volunterring. We are proud of Valley Lee and appreciate all they do to serve our community. You’re right, I always see LPVRS responding to WaWa. Thank God you are ok that’s great it could have been way worse. Hopefully your lights were on? Did you have your lights on? Sunrise was at 6:33 AM. Lights not required after sunrise, and that appears to be a vehicle from sometime in the last 10 years, so daytime running lights are always on. Wiper law only applies if wipers are on, regardless of the weather. Glad you both were ok.
Glad everyone is ok. Many many prayers!!!! Looking on Rockauto, can’t seem to find an “AC consider” listed as an available part in any of the categories. You know most people on here don’t think spelling is important, but I think it’s sad that I had to tell the girl behind the parts counter how to spell “catalytic converter” so she could find the part I needed. I am the driver of the truck. did not see the other car but was amazed how fast the response was to the scene and how nice everyone was to my wife when she was on scene. Great job by all those involved. I am home now after 3 days in the hospital. some bleeding on the brain but it has stopped and I have been discharged. Could have been much worse! Glad you are okay. Praying for both you and the other driver. Glad everyone is ok! Many many prayers!!! !